A visa is a document that allows the bearer to legally enter a foreign country. It is often stamped on a page in the visitor’s international passport. It’s interesting to know that a visa does not in the real sense permit the bearer to enter the foreign country. It only permits the bearer to move from the checking point in his country (the airport) to the foreign country’s entry port. It is actually the consulate at the entrance, that can permit a visa bearer entrance into the country. So, a visa does not guarantee your entry into a foreign country, not literally. Even a visa bearer can be denied entry into a foreign country upon traveling to the checking point. Though this is very rare. There are many countries which a foreigner can travel to without possessing any visa. This is because some of these countries have come together and put in place a visa policy which allows their citizens to travel to and fro without needing a visa from the other country’s embassy. For instance, if you are a Nigerian, you can travel to all West Africa countries without obtaining any visa from the foreign country’s embassy because they are all members of the Economic Community Of West Africa States (ECOWAS). ECOWAS allows the free movement of people between the West African States. Another good example of the visa policy is the Schengen visa. It covers over 20 countries and once you possess it, you can travel to all member states. There are many types of visa. Different countries design their visa to cater for various reasons why foreigners may want to visit the country. For instance, Dubai offers a time-based visa type and foreigners intending to travel to the city have the option of applying for a 48-hour, a 96-hour, and a 14-day visa, depending on the length of time they may want to stay in the city. Dubai visa is a bit unique in the sense that it is majorly time-based. Sure, all visas are time-based and state clearly the time you’ll be required to leave the host country. But most visas are not like the Dubai visa as stated above. For instance, the American visa can be divided into; student visa, business visa, visitor visa etc. This is the most common visa offers among most countries. This purpose-base visa type ensures you select the purpose of your traveling to the foreign country and helps the consulate to determine the length of time you might need to accomplish such goals. The common types of visa have been discussed below in greater details. The tourist/travel/visitor visa is the most common type of visa. This visa is intended for those visiting either friends or family members residing in a foreign country or might want to travel just for the pleasure of it. The visitor visa can be long or short term and the duration of such varies from one country to another. A visitor visa only allows you to ‘visit’ a country; it does not permit you to work, study or do business while in the country. If you intend studying in another country, you need to obtain a student visa from the foreign country’s embassy. The student visa is also called a study visa and is mainly intended for tertiary institution students. To obtain this type of visa, you’ll need to provide proof of admission into an institution in the host country. Business visa is mainly intended for businessmen and businesswomen. If you plan to attend a business conference in the host country, making business partners, signing deals or anything pertaining to business in the host country, it’ll be a good idea to apply for a business visa. In most cases, you’ll be required to provide a letter of invitation to a conference or business meeting if you’re applying for the business visa. The spouse visa covers a lot of ground and is intended for couples. If your spouse is living abroad and you’ll like to join him or her, you can do that easily by applying for a spouse visa. You’ll be required to provide proof of marriage (your marriage certificate) as well as a letter of invitation by your spouse, and in some cases, a copy of your spouse passport and income statement. The work visa is intended for those traveling out to seek greener pastures. You’ll be required to provide a letter of invitation from an employer if you are applying for the work visa. The above is only a list of the most commonly applied for visa types in Nigeria. There are lots of other visa types you can apply for. In fact, almost as a rule, you’ll find a visa type whose description matches your purpose of traveling. There is a visa type for medical travels, sports events, asylum, childbirth etc. Selecting your visa will never be a problem because the visa types are often named after the purpose they represent. And if you’re in any way confused, you can always check the country’s official immigration website for more information. There is no fixed fee for all visa. Countries are free to fix their visa fee as they deem fit. The Nigerian Immigration Service has created a huge list of the visa fees of all countries in the world. This, I believe, could come really handy and decided to provide a link to the visa fee directory for all countries of the world for Nigerians. Please note that the figures provided up there are only the average visa fees. Visa fees vary from country to country and also depends on the visa type you choose. For instance, the US charges an average of $160 for a visa as stated on the Nigerian Immigration Service website but the spouse visa type costs around $265 while a visa for religious purposes costs $190. So, while you can get the average cost of a visa for each country from the above website, each country’s website provides the price of a particular visa type you intend to apply for. 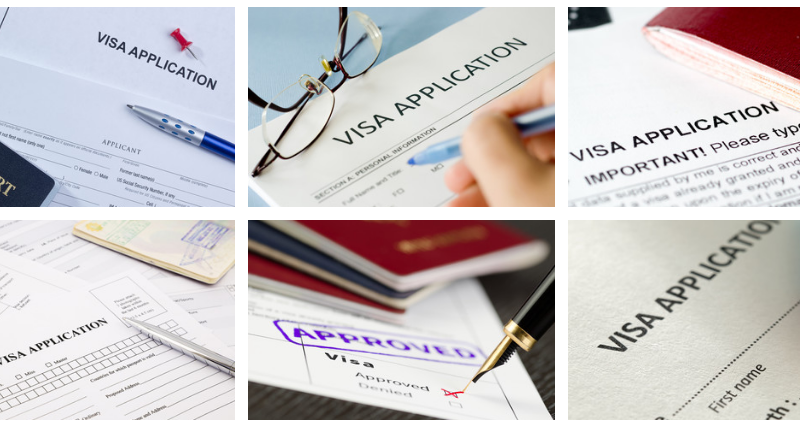 The above are just some of the most commonly required documents for visa application. Visa requirements vary from one country to another. Therefore, it’s prudent to check the requirements of a particular country before submitting your application. When applying for a visa, always keep in mind that the success or denial lies in your ability to provide sufficient proof why you should be allowed to travel out of your country. So include all supporting documents such as a letter of invitation and proof of financial ability to support yourself in the country in your application files before submitting it. Applying for a visa is super easy and often very straightforward. Anyone who had applied for a visa before will tell you that with a straight face. However, getting your visa approved is often the toughest part and in most cases entirely dependent on the official examining your application and the supporting documents. Like everything else, the application process differs between countries. Although the processes are quite different, they almost have the same phases. Most countries’ visa application procedure involves an online phase as well as an offline phase. For the online phase, applicants will be required to create a profile on a particular portal. The UK visa and many others follow this route. Once you create your profile, you’ll be asked to upload your supporting documents and fill an application form, which you’ll then print out and take along with your supporting documents and submit at an approved visa application center. At the visa application center, you’ll be asked to make payments and your biometrics will also be captured. You’ll need to submit your visa application forms and supporting documents and also pay your visa processing fee. All in all, you’ll be asked to pay your visa fee, the processing fee and sometimes a courier service fee. The courier company will deliver your documents as well as your visa once it has been processed. The courier service is optional and you can choose to go back and collect your documents yourself once it has been processed. Visa Tracking is now very popular and almost every country now offers visa applicants the ability to track the progress of their visa right from the time they submit their application forms. Some countries allow you to keep track of your application via the profile you created during the application process but most provide you with a unique tracking number, which you can use to check the status of your visa on the internet. The website and tracking number will be provided once you make payment at the visa application center. 1. Including all supporting documents: supporting documents in most cases are the only things the examiner will access before deciding to grant or deny your visa application. You should, therefore, include all the required documents for a particular visa type because, in most cases, you’ll not be asked to go for an interview or be asked to bring along a missing document. Your application will simply be denied if any important document is not included. No one will ask you to go and bring the missing document. 2. Proof of ties to Nigeria: Consulate officers will want to ensure that once your visitation time is up in their country, you’ll eventually return back to your country. They can only ascertain this if you provide them with sufficient reasons why you’ll eventually come back to your country. Your financial health in the country is the most important indicator of this fact. A person earning a good income will have a higher probability of returning back to Nigeria than a person earning a lower amount. So, your chances of getting your visa approved will be higher if you’re earning more constantly or have good investments in your home country. 3. Be honest: Always be honest when answering questions during your visa interview. Once you’ve been caught lying even once, there’s every chance the interviewer will never believe anything that comes out of your mouth again except with sufficient proof. And even at that, your chances of getting your visa approved will decline. 4. Dress smartly: When going for a visa interview or any other interview at that, your dress sense is a huge determining factor on how the interview will treat. A young man dressed shabbily will most likely be denied a visa. Such will be immediately tagged as rogues and potential vices. Same for ladies. Dress smart and responsibly. This is very important. Getting your visa approved is the most difficult part of traveling out of any country. Visa application is tricky and more of an ‘individual thing’; what worked for a friend might not work for you. But that does not mean that the entire process is dependent on luck. No! In most cases, visa application success lies on two extreme polar. If you can provide sufficient proof why you ‘need’ to travel out of the country to the host country and at the same time provide sufficient proof why you’ll eventually return back to your country once your visa time is up, you shouldn’t have any problem at all getting your visa approved. I hope this piece helps.